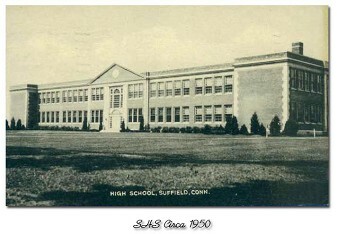 Welcome to the Suffield High School Class Of 1963 website, Suffield, Ct. If you are a class member and want to join the site, please click on either the "Classmate Profiles" or the "Missing Classmates" buttons. When inside, click on your name and follow the instructions. If your name is not listed on the page, hit the "contact us" link at the bottom of the list which will allow you to send your details to the site administrator. Once done you'll receive a response email that will allow you to develop your profile. You'll then be able to post pictures, use the message board, email other classmates etc. This site is totally free to use! If you have any questions about the site or you would like to see features or content added, please become a member first then email us and we'll see if we can make it happen. This site is designed to be both spam free and secure. You must log in before you can view content and use the features. Classmates can choose to hide mailing addresses, telephone #'s etc by checking a box on your profile page. Also if someone outside of the class tries to register, the email request goes to the administrator and will be stopped at that point. SHS Class of 1963 has had 67,450 site hits.